Powerslide 8mm Mag Spacer 8 Stk. 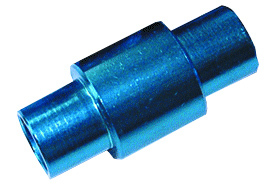 Powerslide Spacer 8mm 8 Stk. Passend für viele Fitness- und Hockey-Inlineskates mit 6 mm Achsen. Im Gegensatz zu herkömmlichen Spacer aus Kunststoff oder Nylon, werden sich diese Aluminium-Spacer niemals verbiegen oder gar brechen - das sorgt für ein perfektes Rollerlebnis. Sehr gut verarbeitet und funktioniert mit den neuen Rollen völlig problemlos! Well made but the tolerance for a 6mm spindle is too great. To centre them, I had to wind two turns of insulating tape around a 6mm bolt to get the bearing centred properly. I used them to replace the wheels on a Samsonite bag using 6mm Marine stainless as a spindle. Used on an in-line skate this mis-sizing could result in eccentric turning of the wheels with obvious disadvantages. Matched like a glove to my new wheels!